There are some pretty crazy prices floating around on a few well known booking sites involving multi-city flights from Vancouver to Tokyo to Hong Kong, and then back to Vancouver, all for under $700 including all taxes. A word of caution up front: It's a little concerning that WebJet and CheapoAir seem to be the only booking agencies displaying these prices. Not in terms of the legitimacy of either booking agency, but just because in the past I've seen them both display prices that they couldn't really deliver on (ie, person thinks they have something booked, but they really don't, and receive a follow-up phone call/e-mail later on saying their flight couldn't be booked at X price). So for those that take the plunge on this one, definitely wait a little while before booking any accommodations or anything that's non-refundable, just to be sure, and keep the expectations low until the dust settles. ^^ There have now been many reports of people receiving their confirmed tickets from WebJet.ca just fine when this same price drop occurred back on April 27. See Update 3 below. Update 1 - April 27 @ 12:04 PM PST - A random check of various dates shows that this may now be sold out. The lowest prices are returning at approximately $1049 CAD. 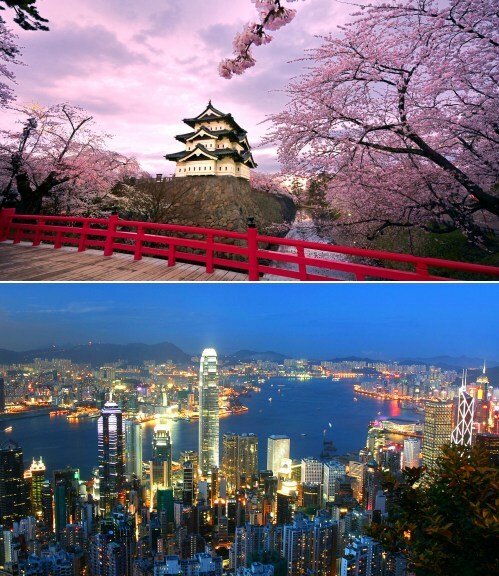 Update 2 - April 28 @ 8:36 AM PST - Vancouver-Tokyo for $644 (non-stop both ways) is back! 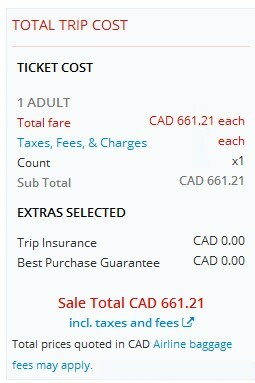 Screenshot from WebJet a few seconds ago: Sep 16-30 - https://www.yvrdeals.com/img/ul/ha489qcpapk0npxm.jpg - the multi-city deal (Tokyo & Hong Kong for $661) does not seem to have returned. Update 3 - April 28 @ 11:57 AM PST - Reports of people receiving their ANA All Nippon reservation numbers for the YVR-Tokyo-Hong Kong-YVR deal via WebJet. See comment section at bottom of blog post. If you go to http://manage.webjet.com/booking-details and enter your booking reference, it should bring up the ANA reservation number. 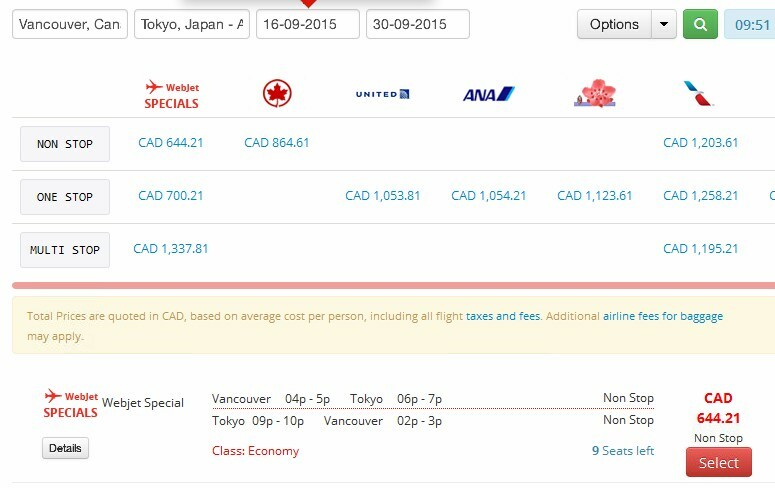 Update 4 - April 28 @ 1:30 PM PST - Vancouver-Tokyo for $644 roundtrip looks to be gone again. $899 seems to be the cheapest available. Update 5 - May 6 @ 9:15 AM PST - The multi-city flights are back on WebJet.ca ! And this time, they're even slightly cheaper, at $630 CAD ! If you bought them at $660 CAD, don't feel too bad about it, these things are impossible to predict, and both prices are ridiculous. There was just as good a chance that they would never return. Try the same dates as shown in Step 1 below. As for dates, pick Wednesday flights, between September 2015 and March 2016. Some date combinations are returning at $661. Others at $689. October 7/14/21 is an example of one currently coming up at $661. Update @ 10:11 AM - Some people are reporting even slightly cheaper date combinations. Sep 02 / 11 / 15 is coming up at $644 on WebJet. Others have non-stop flights between Vancouver-Tokyo, and Tokyo-Hong Kong, with a stop in both Tokyo and Osaka on the way home. That's the best I've seen so far. The October dates above return such an itinerary. The flights are operated by ANA All Nippon, a very highly regarded airline (one of the very few to receive a 5 star rating over at Airlinequality.com). For live discussion of this deal, or to get some amazing travel advice (to anywhere) from 24,497 fellow travelers in Vancouver, join us in the YVR Deals Facebook Group. vancouver, yvr, flight deals, asia, east asia, tokyo, japan, hnd, hong kong, hkg and ana all nippon. 9 Responses to "Vancouver to Tokyo, Japan to Hong Kong and then back to Vancouver - $661 roundtrip including taxes"
Confirmed, it does look to be gone, see Chris's update in the blog post. It's back! Kind of... We just booked a ticket for $644 for end of September, but it's round-trip from YVR to Tokyo and back, no Hong Kong multi-city flight. One thing to note: the confirmation email we just got mentioned "Your booking will now be quality checked and tickets issued typically within 2-3 business hours". Never seen that kind of message before from an airfare booking site... Hopefully they don't say it was a mistake and cancel it! Yeah, this is the problem with sites like CheapoAir and WebJet, where the tickets take a while to process. As opposed to sites like Expedia, Orbitz, or Priceline, where the ticket is processed immediately. Please let us know how it went! I booked for me and my girlfriend last night just past midnight for trip in October to Toyko and Hong Kong for $660.21 per person. Got the email from Webjet with the Webjet booking reference. Like Alain said above, it says reservations with be reviewed and tickets issued typically within 2-3 business hours. I haven't second confirmation email from Webjet with the e-ticket number so this morning, I was trying to find out the status on Webjet.ca under manage my bookings but it keeps timing out and never loads. Therefore, I went on the .com domain, "http://manage.webjet.com/booking-details", typed in my Webjet booking reference/information and I was able to see my trip has been confirmed with e-ticket numbers and ANA reservation number! Thanks Chris for posting this! Excellent, thanks for the update Donald! It will definitely help others out. Got it!!! $644.11 for a return trip ticket to Tokyo, end is September. P.S. : There were 9 other tickets left at that price, last night. Good luck!